Sixteen reigning Olympic and world champions will assemble in Doha on Friday (5) to help kick off the 2017 IAAF Diamond League series, which gets underway for the eighth straight year in the Qatari capital. In all, 43 global medallists are expected on the Qatar Sports Club track for a programme that includes several high profile rematches from last summer's Olympic Games and previews of what we can expect as the season progresses towards the IAAF World Championships London 2017 in August. 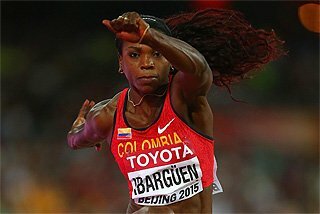 Among the evening's most anticipated contests is the women's 800m, which reunites not only the top three finishers from last August's Rio Games – South Africa's Olympic champion Caster Semenya, Francine Niyonsaba of Burundi and Kenyan Margaret Nyambui – but also features world 1500m record-holder Genzebe Dibaba’s eagerly awaited debut over the distance. Semenya, the 2016 Diamond Trophy winner, was unbeaten over the distance last year and Niyonsaba captured the world indoor title while Dibaba has won world gold in 2015 and Olympic silver in 2016 at 1500m. 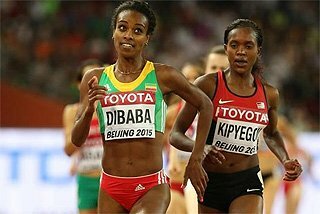 In those two races, the Ethiopian covered the last 800m in 1:57.2 and 1:58.47 respectively, suggesting she’s clearly capable of holding her own with the event’s finest runners. 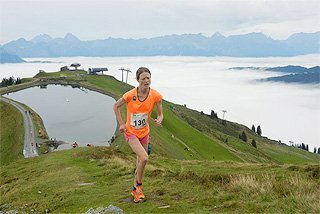 Watch out too for Pole Joanna Jozwik, this year’s world indoor leader, who’ll be making her outdoor season’s debut. But there is star power across the programme. The women’s 200m features the first meeting of the year between rivals Elaine Thompson and Dafne Schippers, the event’s Olympic and world champions, respectively. 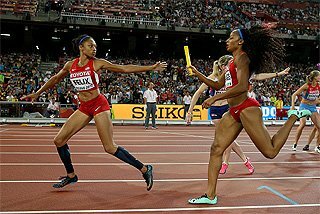 Both have displayed solid early season form, Thompson with a wind-aided 10.75 in the 100m and Schippers with 10.95 and 22.29 100m and 200m performances, all in mid-April. Marie-Josee Ta Lou of Ivory Coast, who finished fourth in the Olympic 100m and 200m finals, will also be in the field, along with Veronica Campbell-Brown, the 2004 and 2008 Olympic champion. Meanwhile, the men’s 100m has shaped up into a battle between two generations, with Canada’s triple Olympic medallist Andre de Grasse and South African Akani Simbine, 22 and 23 respectively, taking on Olympic silver medallist Justin Gatlin and former world record-holder Asafa Powell. Simbine, who clocked a national record of 9.89 last year, has already dashed 9.92 this season while de Grasse will be making his season’s solo debut after producing some impressive relay legs at the IAAF World Relays in Nassau 10 days ago. Watch out too for rising US star Ronnie Baker who after an unbeaten indoor season over 60m, opened his outdoor campaign with a 9.99 lifetime best at the Mt SAC Relays. The men's 400m is equally packed with talent, featuring Bahamian Steven Gardiner, the current world leader at 44.26, who electrified his home crowd at the World Relays. Out to curb his momentum are 2008 Olympic champions LaShawn Merritt of the US, who set the meeting record of 44.19 in 2014; Botswana’s 18-year-old rising star Karabo Sibanda, an Olympic finalist last year; and the event’s top indoor star, world indoor champion Pavel Maslak of the Czech Republic. 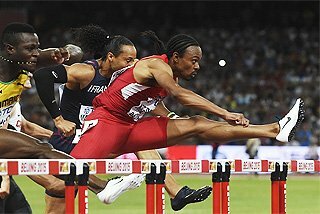 Both hurdles races also feature Olympic and world medallists. In the women’s 100m hurdles, world record-holder Kendra Harrison kicks off her IAAF Diamond League campaign riding the momentum of two early season victories to arrive as the world leader at 12.56. Harrison will take on Olympic silver medallist Nia Ali, Olympic fourth-placer Cindy Ofili of Great Britain, and Germany’s Cindy Roleder, the European champion and world silver medallist. The men’s 400m hurdles – not a point-scoring event in Doha – features Olympic gold and silver medallists Kerron Clement of the US and Kenyan Bonface Mucheru. They will be facing a new talent for the first time, Qatar’s 21-year-old Abderrahman Samba, who’s the surprise early season world leader at 48.31. Kenyan Nicholas Bett, the world champion, is also in the field. On the infield, the primary focus will fall on the south end of the stadium and the men’s high jump, where Qatar’s biggest athletics star Mutaz Barshim will be defending home turf. 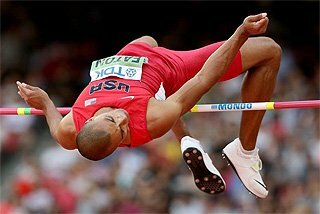 Barshim, history’s second highest jumper at 2.43m, the Olympic silver medallist and two-time Diamond Trophy winner, has yet to claim a victory at Doha’s Diamond League fixture but this year starts as the world leader after a 2.35m clearance in Jeddah 19 days ago. Erik Kynard of the US, the 2016 Diamond Trophy winner, and Robbie Grabarz of Great Britain, who shared the bronze with Barshim at the 2012 Olympics, will be the home star’s key competition. The women’s pole vault also features the Rio 1-2, with Olympic champion Ekaterini Stefanidi of Greece beginning her Diamond Trophy title defence by taking on Sandi Morris of the US, the Rio silver medallist and newest member of the event’s five-metre club after her 5.00m clearance at the last year’s IAAF Diamond League final in Brussels. Yarisley Silva of Cuba, the world champion, is also in the field. In the men’s triple jump, two-time world and Olympic champion Christian Taylor will be the favourite as he targets a third Doha win. In an epic duel two years ago with Pedro Pablo Pichardo, Taylor jumped a then-PB of 18.04m, losing by two centimetres to the Cuban to become the only man in history to sail beyond 18 metres and be denied a victory. 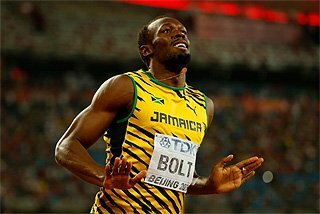 This year the 26-year-old US record-holder’s chief rival will be China’s Dong Bin, the world indoor champion and Olympic bronze medallist. Taylor, a five-time Diamond Trophy winner, has been in action twice this season, with 17.26m his best. Olympic champions figure prominently in both of the programme’s throws events. Thomas Rohler of Germany heads the javelin field, squaring off against Kenya’s world champion Julius Yego and Jakub Vadlejch of the Czech Republic, last year’s Diamond Trophy winner. Of the three, only Vadlejch has competed this year, throwing 85.71m in early April. Locals will keep an eye on Qatar’s rising talent Ahmed Bedeer Magour, a finalist at last year’s Olympics. In all, six of the top 10 finishers in Rio will start in Doha. 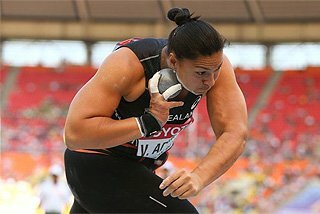 In the women's shot put, which kicks off the programme at 18:00 local, Olympic champion Michelle Carter of the US leads the field, which also includes Hungary's Anita Marton, the European indoor champion, Olympic bronze medallist and current world leader at 19.63m. Moving up to the evening’s longer distances, the women’s steeplechase is the most loaded, featuring an Olympic podium reunion led by Ruth Jebet, who followed up her Olympic heroics with an 8:52.78 world record run at the Paris leg of the IAAF Diamond League. 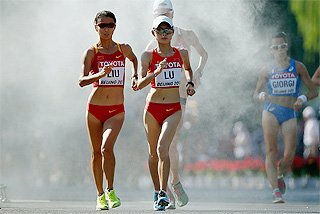 The Bahraini will again face Kenya’s world champion Hyvin Kiyeng and US record-holder Emma Coburn, the Olympic silver and bronze medallists. The man to watch in the men’s 1500m is a familiar face in Doha, three-time world champion Asbel Kiprop, who’ll be gunning for a fourth victory here. The Kenyan is the meeting record-holder at 3:29.18, the fastest ever performance in the month of May, and returns after notching a resounding victory last year. Another win on Friday would be his 24th in IAAF Diamond League competition. 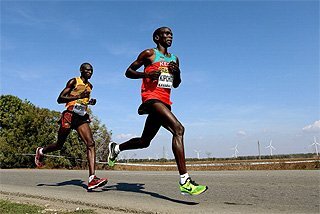 His compatriots are expected to provide the stiffest competition, namely Silas Kiplagat, the 2011 world silver medallist and two-time Diamond Race winner, and Elijah Manangoi, the world silver medallist. Ayanleh Souleiman of Djibouti, the 2014 world indoor champion, could also be a factor. He's raced well in Doha before, beating a stacked field in the 800m two years ago. As has become tradition, the meeting will conclude with the men’s 3000m which features more Olympic and world medallists, led by Olympic steeplechase champion Conseslus Kipruto. 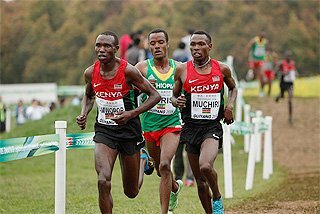 The 22-year-old will take on Olympic 5000m silver medallist Paul Chelimo of the US, Ethiopia’s world indoor champion Yomif Kejelcha, and 2012 Olympic bronze medallist Thomas Longosiwa of Kenya. In its biggest restructure since the series began in 2010, this year’s IAAF Diamond League will adopt a championship-style model whereby athletes earn points at the first 12 meetings to qualify for the two finals. In previous seasons, athletes accumulated points throughout the IAAF Diamond League season with the overall winner of each of the 32 disciplines being the athlete with the most points, irrespective of whether they won the final. This year, the winners of each discipline in the finals will be crowned as IAAF Diamond League champions, earning a $50,000 bonus and the Diamond Trophy. The scoring system has also changed for 2017. Whereas previously only the top six finishers in each discipline earned points, the top eight will now be rewarded. 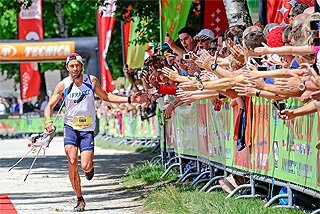 Eight points will go to the winner, seven points to second place and so on, with one point going to the athlete in eighth place. Each discipline will be staged six or four times before the finals. At the end of the 12 qualification meetings, the top seven, eight or 12 athletes (depending on the discipline) will be invited to compete in the final. In case of a tie, the best legal performance of the qualification phase wins.